When electrical and mechanical work is undertaken, it is crucial that employers not only carry out a hazard analysis, but also make sure that workers have access to international standard protective equipment, including gloves, to protect them against the hazards of arc faults. “The hand and forearm region is particularly at risk of being burnt by arc faults whilst working on an electrical installation,” explains Hano Oelofse head of technical division at DEHN Africa. “DEHNcare arc protective gloves (APG), part of the DEHNcare personal protective equipment (PPE) range, are a necessary shield against second-degree skin burns caused by arc faults. The protective gloves are arc-fault-tested according to class 2 (IEC 61482-1-2) and certified according to the EEC directive. The combination of leather and neoprene, as well as the high-quality workmanship, ensures a comfortable fit and protects the hands and arms region from second-degree burns”, he states. The DEHNcare protective glove comes with a long gauntlet, which protects up to the crook of the arm, while the palm of the glove offers touch sensitivity and breathable materials for maximum wearing comfort. 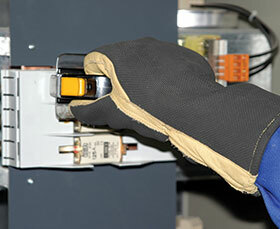 “Protective gloves are used for maintenance and repair work at electrical installations for protection against thermal and mechanical risks and should be worn when this type of work is performed,” concludes Oelofse.